PULLMAN, Wash. – Researchers analyzing the genomes of cultivated cacao trees have traced their origin to a “single domestication event” some 3,600 years ago. The discovery opens a new front in a long-running argument regarding when and where humans started growing the source of chocolate. 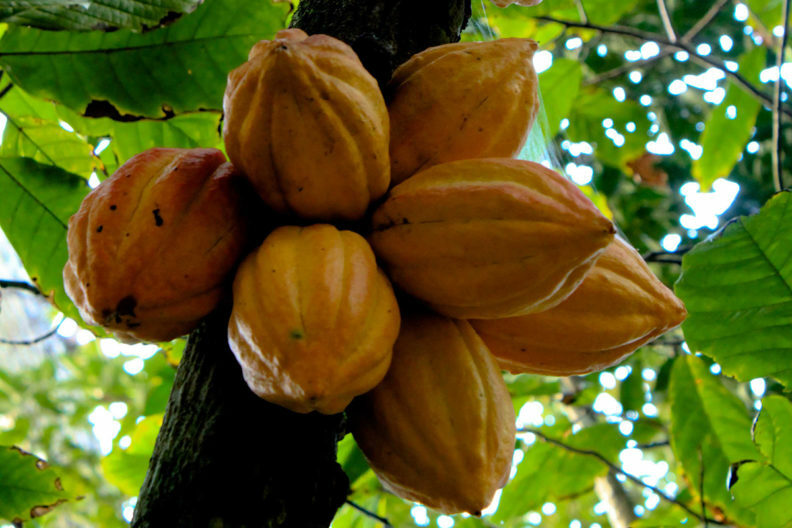 The study, which involved 18 scientists from 11 institutions, also found that cacao’s domestication ended up selecting for flavor, disease resistance and the stimulant theobromine. However, that came at the cost of retaining genes that lowered crop yields. Researchers sequenced the Theobroma cacao genome in 2010. That laid out what Cornejo refers to as an archetype of the cacao genome, while this study, by sequencing 200 plants, teases out variations in the genome that can reveal the plant’s evolutionary history. The researchers looked at “the prince of cocoas,” Criollo — rare, flavorful and the first to be domesticated. They found that it was domesticated in Central America 3,600 years ago, but originated in the Amazon basin, near the modern-day border of southern Colombia and northern Ecuador, from an ancient germplasm known as Curaray. Chances are it was introduced to Central America by traders, said Cornejo. The tree’s population at the time consisted of between 437 and 2,674 individual trees, and most likely about 738 trees. The time of domestication 3,600 years ago, with margins of 2,481 and 10,903 years ago, is consistent with traces of theobromine found in Olmec pottery and large-scale analyses of ancient and modern human DNA that put colonization of the Americas at roughly 13,000 years ago. The researchers also saw support for a hypothesis that domestication carries a cost as growers, in choosing plants with desirable traits, can ultimately make plants that accumulate counterproductive genes —“deleterious mutations” — making them less fit. Insights from the study could help identify genes behind specific traits that breeders can emphasize, including yield. “What we would like to have is a way to combine plants from populations with high productivity — like Iquitos — with plants of Criollo origin, while retaining all these desirable traits that make Criollo cacao be the best in the world,” said Cornejo. Cornejo worked on the study at both WSU, where he used the high-performance computational power of the Center for Institutional Research Computing for the analyses, and Stanford University, where he was a post‑doc in the lab of Carlos Bustamante, a co‑author on the paper, where the sequencing of the data was done. Funding for the research came from Mars, Incorporated, which has undertaken a large effort to sequence and study the cacao genome.